Edward Segal Inc. can help you with the design of automated assembly machines from simple rotary table assembly to fully automatic in-line assembly processes. 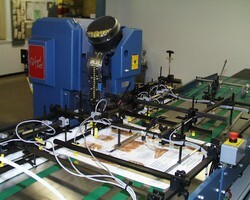 As shown by these examples, Edward Segal Inc. has developed a machine to feed, eyelet and collate three different sizes of laminated charts. Each chart is fed onto a conveyor and programmed to make two stops, each stop to permit an eyelet to be attached in the corners of the charts. To maximize speed, the Model 83HS servo powered eyelet machine is used to feed and set the eyelet in less than 0.1 seconds! 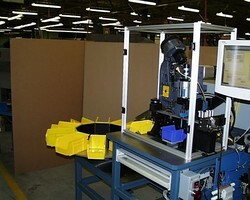 This high speed allows the machine to achieve a production rate of over sixty 8-1/2" x 11" charts per minute. Another machine was designed to feed shim stock, punch a hole, feed and set an eyelet, cut parts to length, and sort different parts into bins. To maximize production capabilities, the machine features servo motor power for both the roll feed and the Model 83HS high-speed eyelet machine. 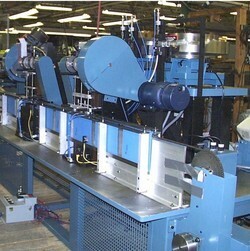 The machine is fully programmable and allows the user to program the length of each strip, the spacing between eyelets, and the hole punch and eyelet pattern.